Don't you just love a foot rub? It is soothing and relaxing and more beneficial than you may think. 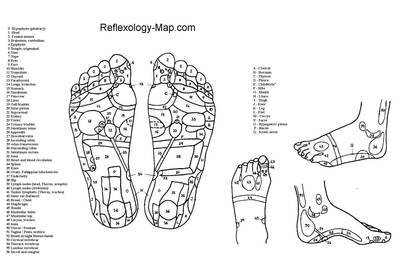 Reflexology is the practice of applying pressure with hands on your feet. The soles of your feet are believed to have zones that correspond to your entire body. Apply light to medium pressure with your thumb or fingers, pressing intermittently. Rotate the foot at the ankle with your hand to relax your body. When you think how your feet carry the weight of your body everyday, and has done for many years, it's a nice thing to thank them and treat them with a massage.